RapReviews.com Feature for October 5, 2010 - Hell Razah's "Heaven Razah"
In April of 2010 rumors surfaced online that former Sunz of Man member and long-time Wu-Tang affiliate Hell Razah had suffered a brain aneurysm and was in a coma. Ominously Razah's Twitter account fell silent at almost the exact same time and hasn't been updated since. When Razah's label Nature Sounds sent out the following tweet, it all but confirmed our worst fears: "Please keep @Razah_Rubiez in your prayers. He's a strong brother who needs privacy while he focuses on his recovery." Speculation on the internet has been rampant ever since - what really happened to Razah, what does this mean for his recording career, and how is he doing these days? 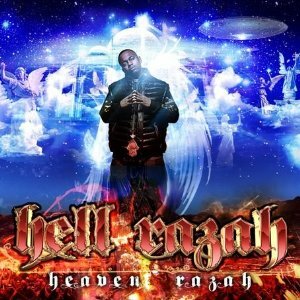 Sorry - "Heaven Razah" won't answer any of those questions. HR either had enough material recorded for Nature Sounds to compile it into an album and release it, or he recovered enough to finish the album he had started. To be perfectly honest and possibly offensive (and I do apologize if it is) I'm not sure I'd be able to tell the difference between his flow before and after brain injury. That's not to imply Razah's not an intelligent emcee - in fact he clearly takes his time and thinks about the meaning behind each word he spits for both himself and his listening audience. He takes after fellow former Sunz of Man member Killah Priest a lot in that respect - in fact they often sound like brothers from different mothers. What sets Razah apart is how SLOW he is. Priest may at times sound like he's spitting drunken monkey fu, but Razah sounds like he's binging on a cocktail of methadone and vodka. Each syllable falls from his vocal chords like it was locked up in jail for decades and had no idea what to do when finally freed. Turn the hood to the woods or a dark safari"
Well better me and Heaven Razah take it back to the 80's"
The great grandson of David, Rebekah's favorite"
Good luck trying to untwist the different layers of mysticism, Egyptology, science fiction and Christianity twisted up in a Hell Razah rap. He's just as likely to claim to be saved by an angel as to be beamed up to heaven by a UFO. "They watchin us" says Razah. Who is watching us? Nobody - and everybody. I've often wondered if even Razah understands the point he's trying to make, but that doesn't make his music any less fascinating or interesting to listen to. Only an artist as intricately wound as Hell Razah could sample from "The Mack" and flow over symphonic strings about 10 commandments taking him straight to Atlantis before the sun sets over Planet X on "The Book of Heaven Razah," which he of course claims was written on Papyrus paper. "It's like the devil signing Jesus to a record deal." He offers these random statements in an almost stream-of-consciousness fashion, at times sounding supremely profound, and at other times like a babbling fool who just happened to stumble across something sounding wise by accident. You can't ever be 100% sure of which. "Heaven Razah" is undoubtedly one of Razah's most well produced and complex albums, layered up with hard hitting beats and pop culture dialogue snippets. You have to be willing to swallow a bit of BS lyrically on songs like "Medical Kush" and "Cinematic," but at the same time they're balanced out by cuts like "A Brooklyn Tale" featuring Shabazz the Disciple and "My Testimony" featuring Darnell McClain. When Razah can be kept focused and on topic he ranks as among rap's most fascinating and powerful hip-hop artists. At other times he lives up to the words of "Brooklyn Tale" when he says "the money and the fame just drove him insane." Maybe they did quite literally in his case, but I can only hope that in the time since his tweets went silent his mind did not as well. Though he can't decide for five minutes at a time who or what is responsible for the ills of the world, his passion for bringing the truth to light as he sees it whatever that might be is always an interesting listen. Hopefully we can all look forward to more of Razah's rubies.